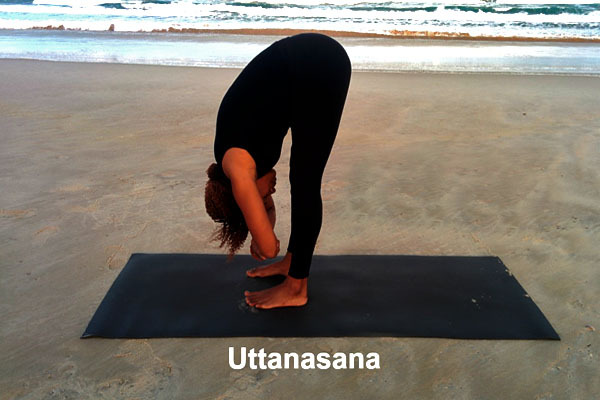 Through the space between your legs, reach your right arm through and interlace the fingers on your left hamstrings. Take an inhale, and as you exhale, pull the left thigh towards your body. You can deepen this further, by gently pressing the right elbow against the inner right thigh. Hold for 10 breaths and then switch sides. Starting in Downward Dog, step the right foot forward outside of the right hand so the foot and hands are in one line. Lower the left knee down on the mat, and if the body allows, lower both elbows to the floor (or onto blocks if the floor is too deep). Lizard pose can be an intense and deep hip opener, so focus on exhalations and consciously letting the pelvis draw down to the earth. Stay in Lizard pose for 1 to 2 minutes, and then change sides. Using Downward Dog as your starting point, bring the right knee forward and towards the right side of the mat. The right foot will be mostly on the left side of the mat, in front of the left hip. Be mindful of any knee discomfort. The right shin bone might be on an angle or it might be parallel to the front of the mat, it will depend on your own hip flexibility. Begin to lower the spine forward and down. Think of both of the hip points as equal distance from the mat, and begin to energetically press the pelvis towards the back heel. This can be held passively for 1 to 3 minutes on each side. If you have any knee issues that prevent you from being in this pose, repeat thread-the-needle pose. Start with the feet roughly hip-width apart. On an inhale, lift the heart, and on an exhale, hinge the body forward, folding from the hips. As we are looking to create space in the lower back, think of having the lower ribs fairly close to the thighs by bending the knees accordingly. This is a fairly good indication that the spine is long and spacious from the tailbone to the base of the skull. Allow this to be a passive forward bend, by holding on to the opposite elbow or forearm, and letting the weight of the head drop down towards the earth with each exhalation. Hold for 1 to 3 minutes. Lying down on your back, bring your right knee towards the heart. With your left hand, take the knee and cross it over towards the floor on your left. Widen your chest by taking the right arm to the right side, keeping it in line with the shoulders. Inhale and feel the spine lengthen and the ribcage expand, on the exhalation ground equally through the back of your shoulders. Maintain the twist for 5 to 7 breaths before doing the other side. Lying on your belly, reach your arms behind your back and clasp your hands, pressing firmly the palms together. Take an inhale and lift the chest and legs. Maintaining your breath take the clasped hands and bring them higher, drawing the shoulder heads back. Maintain this position for roughly 5 to 7 breaths. Once you release, press into a child’s pose. As with any practice, irrespective of the length of time, include a savasana. You can place a rolled up towel beneath the lower back to help maintain its natural curve.